At one time this enchanting little cobbled street, hidden away in the 12th arrondissement, was a “secret place” few people knew about. These days, however, Rue Crémieux is an increasingly sought out haunt for fashion photographers, filmmakers, and people looking for something uniquely suited the color-saturated world of Instagram. 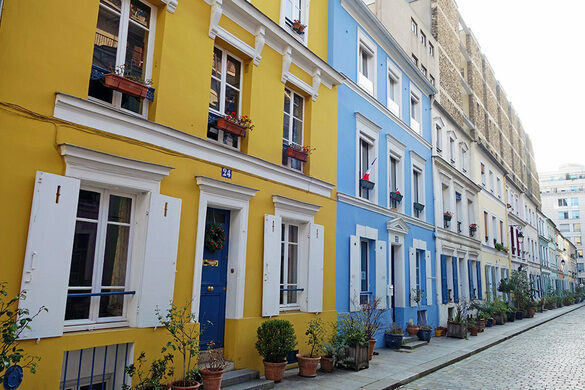 In many respects, this quaint throughway between Rue de Lyon and Rue de Bercy doesn’t really feel like Paris at all and is perhaps more reminiscent of Portobello Road in London’s Notting Hill, or Burano in Venice. Amid the colorful façades, trompes l’œil paintings, and shuttered windows, are window boxes and terracotta pots filled with lush plants that add to the feeling you have somehow escaped Paris for a moment. This is a residential street, albeit a very short one, but the homes are not large. In fact, on one side of the street, the building is little more than one room in depth. An interesting fact that few visitors to Rue Crémieux probably realize is that the street is actually named after a lawyer. Jokes aside, it was renamed in 1897 in dedication to Adolphe Crémieux, who defended the human rights of the Jewish people living in France. Remember, this is a residential street, so be respectful of the occupants' privacy.